This item group is specially focusing on providing with suprising low price based on the concept of "Price focus brand". There are mainly daily necessaries in this lineup, and this is to meet the customer's expectation to find the lower prices. 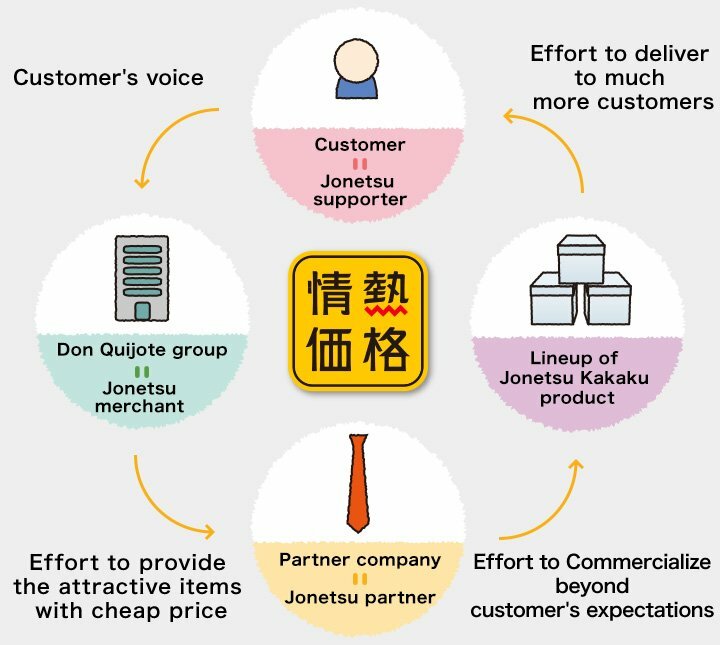 Based on the concept of "Additional value brand", this is the lineup of products which is better than Jonetsu Kakaku items in terms of quality, function and design. These are the items to secure the quality enough to make the customer happy with the value price, and the purpose is to provide of "petit convenience and petit happy". This is the best brandline of "Jonetsu Kakaku" which will be the only item in terms of quality, function and design. During product development, every item is based on the customer's "Want", and we are expecting that customer will be happy to find the product, saying "This is what I wanted." "Based on customers' requests, we'll make the quality product with low price." This is our commitment to customers. "If there could be such a feature, that might be very nice", "Daily necessities should be available in reasonable price..". 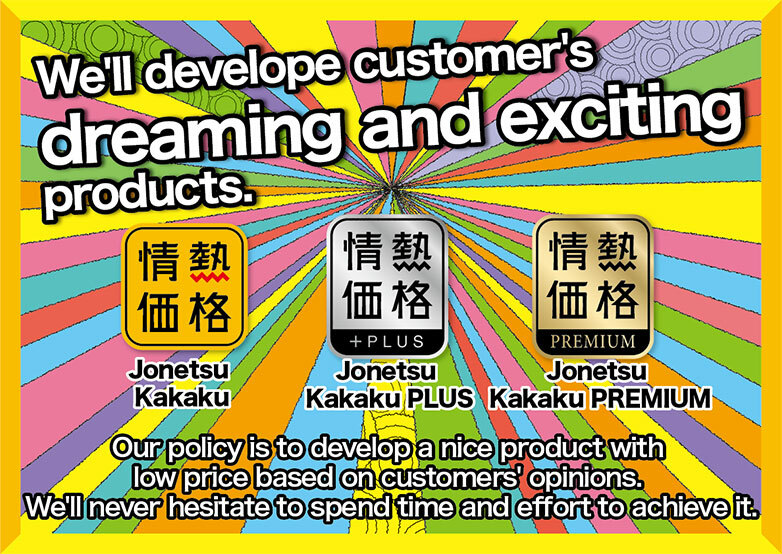 "Jonetsu Kakaku" was born when we seriously thought about these customers' voices. Then, we collaborate with competent domestic and overseas maker to realize the customers' requests. As private brand, "Low price" is just as normal. So, we add our original and additional values like "funny", "tasty", "stylish", "convenient" which might exceed the customers's expectation, and we deliver something that make all customers feel excited, happy and surprised. To make it realize, "Jonetsu Kakaku" team considers customer as "Passion supporter", opinions from customer as "Ideas for product development". Also in order to deliver better products with lower price, considering the competent domestic and overseas maker as "Passion partner", Don Quijote group who wish to deliver the excellent products to much more customers as "Passion merchant", we are actively working on the product development and improvement based on customers' requests. Since 2009, we've been expanding item lineup, like food, living groceries, kitchen items, beauty goods, health items, germents, home appliances, interior/bedding cloths, sports/outdoor goods, car accessaries, bicycles, pet items, toy/amusement goods, etc. Now, number of items are over 2000, and still it's increasing. We promise to become a closest and most favorite brand, by providing with the customer's dreaming and exciting products, as well as supporting customers' life. Wave of passion = "Red wave" containes our strong wish to form a strong bond between customers (supporter), producter (maker) and seller (Don Quijote group) through our products.